Are you ready to claim the throne, take over treasure and be the sole ruler? Prove who the king is of king’s in Royal Family slot – this new medieval game from Yggdrasil! Royal family is a 5-reel, 4-row and 25-payline online slot that comes with collectable feature items and free spins game. Wear your royal crown and enjoy this slot’s medium to high variance for only 10 to £200 per spin. This is the first ever exclusive Yggdrasil White Label Studios game. It is also the first in the LeoVegas Original series. You will find gold royal adornments like a crown, a chalice and a knight’s armour. Merriment awaits you in this game, with cartoon-style graphics and a beautiful castle in the background. 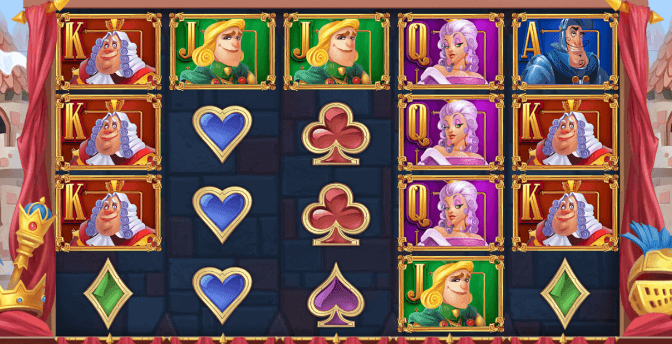 Royal family slot has 4 lower value symbols: spades, hearts, clubs and diamonds. Traditional card numbers A, K, Q and J are the high-paying symbols. The high-value symbols are queens, kings, princes and knights. Land 5 A, the most rewarding symbol, and receive up to 10 times your stake. Always be on the lookout for the free spins symbol. Land 3, 4 or 5 free spins symbols and receive 8, 16 or 24 respectively. In this feature, all high-pay values; A, K, Q and J can randomly turn into sticky wilds. Enjoy 12 different feature prizes in the base game, during the free spins mode. Every reel will have its own unity collectable prize and only one prize can be collected for each free spin round. Collect 2 feature prizes on 1 reel and trigger the Free Spins feature, which in turn allows you to collect 2 or more feature prizes. 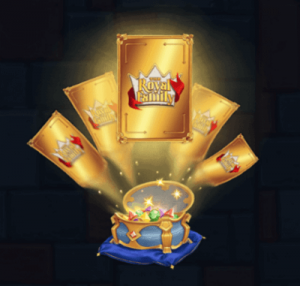 Land the Royal Chest symbol on reel five and win a cash prize of up to 100x in the base game. Activate this feature in Free Spins mode and get 4 additional Free Spins and 3 sticky wilds. It is easy to like the Royal Family slot; it looks stunning and comes with plenty of extra features. You are likely to love the free spins and collectable gifts. Check out our list of online casinos to find out where to play this and other exciting games!